There is something cleansing in the voice of Keith Howden. The words lay heavy with the certain burden of memory, but their weight is appreciated like the weight of gems that tell stories with their shapes, colors and reflection of the light. Keith Howden tells the story of a working class village in the 1930 through poems and stories, and through a wise, Johnny cash-like voice he can immerse the listener in the era where his stories come from. The 14 parts I am listening to can grasp the heart of the listener even if they were recorded alone and naked, but there is also music that brings more magic to this world. 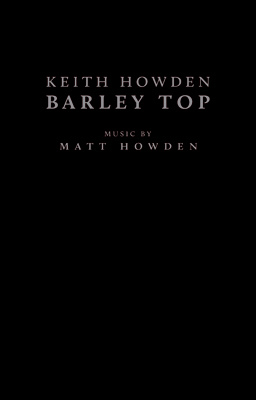 “Barely Top” comes as a beautiful black book by Keith Howden, and an album, the one I am listening to, with his spoken words and music by his son, Matt Howden, who has some great albums under his name and of course as ‘Sieben’. Matt Howden orchestrates the magnificent soundtrack to the words of his father, sewing them to the delicate fabric of music lead by his violin. On one hand Matt’s music serves as a beautiful stage to the words of his father, standing in the background in respect to the text, but on the other hand Matt knows how to write and execute a wonderful, touching and complete creation. Complete- because it can work well as an instrumental album, but together with the words of his father, ‘Barely Top’ is more than a good album. It is a creation that is bigger, much bigger than its two brilliant ingredients. It is not often that I get to review a complex release in the form of a book and an album with the music to it. I am more than happy to have had the opportunity to do write my own words about ‘Barely Top’ and I offer this free advice for you to do listen to the music, listen to the words and read them as well.